Purchased with funds from the Morton R. Hirschberg Bequest and gifts from Diane DeMell Jacobsen, Ph.D. in loving memory of her husband Thomas H. Jacobsen and James and Diane Burke in memory of Thomas H. Jacobsen. Rolph Scarlett had a varied career in the arts, working as a theatrical designer and jeweler. He experimented with several artistic styles before committing to Abstraction. 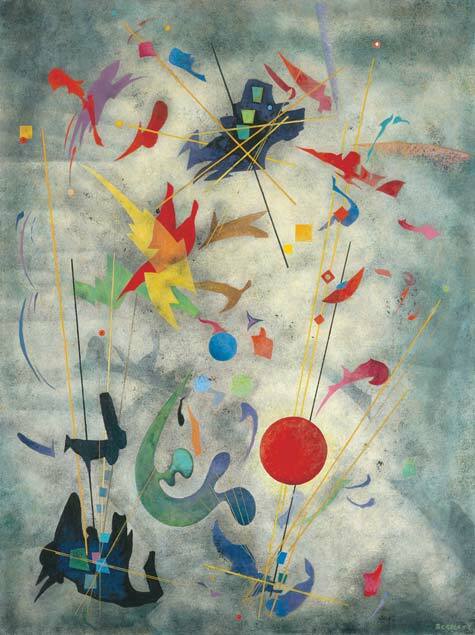 Scarlett’s work appealed to Hilla Rebay and Solomon Guggenheim, who were forming the collection of the Museum of Non-Objective Painting (now the Solomon R. Guggenheim Museum). Not only did they purchase more than 60 of Scarlett’s paintings for the new museum, they also hired Scarlett as chief lecturer.